The term high voltage usually means electrical energy at voltages high enough to inflict harm on living organisms. Equipment and conductors that carry high voltage warrant particular safety requirements and procedures. In certain industries, high voltage means voltage above a particular threshold (see below). High voltage is used in electrical power distribution, in cathode ray tubes, to generate X-rays and particle beams, to demonstrate arcing, for ignition, in photomultiplier tubes, and in high power amplifier vacuum tubes and other industrial, military and scientific applications. The numerical definition of "high voltage" depends on context. 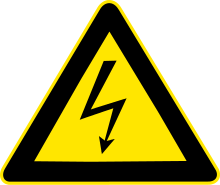 Two factors considered in classifying a voltage as "high voltage" are the possibility of causing a spark in air, and the danger of electric shock by contact or proximity. The definitions may refer to the voltage between two conductors of a system, or between any conductor and ground. The International Electrotechnical Commission and its national counterparts (IET, IEEE, VDE, etc.) define high voltage as above 1000 V for alternating current, and at least 1500 V for direct current—and distinguish it from low voltage (50 to 1000 VAC or 120–1500 VDC) and extralow voltage (<50 VAC or <120 VDC) circuits. This is in the context of building wiring and the safety of electrical apparatus. In the United States 2011 National Electrical Code (NEC) is the standard regulating most electrical installations. There are no definitions relating to high voltage. The NEC covers voltages 600 volts and less and that over 600 volts. The National Electrical Manufacturer's Association (NEMA) defines high voltage as over 100 to 230 kV. British Standard BS 7671:2008 defines high voltage as any voltage difference between conductors that is higher than 1000 VAC or 1500 V ripple-free DC, or any voltage difference between a conductor and Earth that is higher than 600 VAC or 900 V ripple-free DC. Electricians may only be licensed for particular voltage classes in some jurisdictions. For example, an electrical license for a specialized sub-trade such as installation of HVAC systems, fire alarm systems, closed circuit television systems may be authorized to install systems energized up to only 30 volts between conductors, and may not be permitted to work on mains-voltage circuits. The general public may consider household mains circuits (100 to 250 VAC), which carry the highest voltages they normally encounter, to be high voltage. Voltages over approximately 50 volts can usually cause dangerous amounts of current to flow through a human being who touches two points of a circuit—so safety standards, in general, are more restrictive around such circuits. The definition of extrahigh voltage (EHV) again depends on context. In electric power transmission engineering, EHV is classified as voltages in the range of 345,000 - 765,000 volts. In electronics systems, a power supply that provides greater than 275,000 volts is called an EHV Power Supply, and is often used in experiments in physics. The accelerating voltage for a television cathode ray tube may be described as extrahigh voltage or extrahigh tension (EHT), compared to other voltage supplies within the equipment. This type of supply ranges from 5 kV to about 30 kV. In automotive engineering, high voltage is defined as voltage in range 30 to 1000 VAC or 60 to 1500 VDC. In digital electronics, a high voltage usually refers to something representing a logic 1 in positive logic and a logic 0 in negative logic. It is not used to indicate a hazardous voltage and levels between ICs to TTL/CMOS standards and their modern derivatives are well below hazardous levels. The highest in mainstream use were 15 V for original CMOS and 5 V for TTL but modern devices use 3.3 V, with 1.8 V or lower used in many applications. Accidental contact with any high voltage supplying sufficient energy may result in severe injury or death. This can occur as a person's body provides a path for current flow, causing tissue damage and heart failure. Other injuries can include burns from the arc generated by the accidental contact. These burns can be especially dangerous if the victim's airway is affected. Injuries may also be suffered as a result of the physical forces experienced by people who fall from a great height or are thrown a considerable distance. Safety equipment used by electrical workers includes insulated rubber gloves and mats. These protect the user from electric shock. Safety equipment is tested regularly to ensure it is still protecting the user. Test regulations vary according to country. Testing companies can test at up 300,000 volts and offer services from glove testing to Elevated Working Platform (or EWP) testing. A high voltage is not necessarily dangerous if it cannot deliver substantial current. The common static electric sparks seen under low-humidity conditions always involve voltage well above 700 V. For example, sparks to car doors in winter can involve voltages as high as 20,000 V. Also, physics demonstration devices such as Van de Graaff generators and Wimshurst machines can produce voltages approaching one million volts, yet at worst they deliver a brief sting. That is because the number of electrons involved is not high. These devices have a limited amount of stored energy, so the average current produced is low and usually for a short time, with impulses peaking in the 1 A range for a nanosecond. During the discharge, these machines apply high voltage to the body for only a millionth of a second or less. So a low current is applied for a very short time, and the number of electrons involved is very small. The discharge may involve extremely high voltage over very short periods, but, to produce heart fibrillation, an electric power supply must produce a significant current in the heart muscle continuing for many milliseconds, and must deposit a total energy in the range of at least millijoules or higher. Relatively high current at anything more than about fifty volts can therefore be medically significant and potentially fatal. Tesla coils are not electrostatic machines and can produce significant currents for a sustained interval. Although their appearance in operation is similar to high voltage static electricity devices, the current supplied to a human body will be relatively constant as long as contact is maintained, and the voltage will be much higher than the break-down voltage of human skin. As a consequence, the output of a Tesla coil can be dangerous or even fatal. Electrical transmission and distribution lines for electric power typically use voltages between tens and hundreds of kilovolts, so contact with or close approach to the line conductors presents a danger of electrocution. Contact with overhead wires is a frequent cause of injury or death. Metal ladders, farm equipment, boat masts, construction machinery, aerial antennas, and similar objects are frequently involved in fatal contact with overhead wires. Digging into a buried cable can also be dangerous to workers at an excavation site. Digging equipment (either hand tools or machine driven) that contacts a buried cable may energize piping or the ground in the area, resulting in electrocution of nearby workers. A fault in a high-voltage transmission line or substation may result in high currents flowing along the surface of the earth, producing an earth potential rise that also presents a danger of electric shock. Depending on the prospective short-circuit current available at a switchgear line-up, a hazard is presented to maintenance and operating personnel due to the possibility of a high-intensity electric arc. Maximum temperature of an arc can exceed 10,000 kelvins, and the radiant heat, expanding hot air, and explosive vaporization of metal and insulation material can cause severe injury to unprotected workers. Such switchgear line-ups and high-energy arc sources are commonly present in electric power utility substations and generating stations, industrial plants and large commercial buildings. In the United States, the National Fire Protection Association, has published a guideline standard NFPA 70E for evaluating and calculating arc flash hazard, and provides standards for the protective clothing required for electrical workers exposed to such hazards in the workplace. The largest scale sparks are those produced naturally by lightning. An average bolt of negative lightning carries a current of 30 to 50 kiloamperes, transfers a charge of 5 coulombs, and dissipates 500 megajoules of energy (120 kg TNT equivalent, or enough to light a 100-watt light bulb for approximately 2 months). However, an average bolt of positive lightning (from the top of a thunderstorm) may carry a current of 300 to 500 kiloamperes, transfer a charge of up to 300 coulombs, have a potential difference up to 1 gigavolt (a billion volts), and may dissipate 300 GJ of energy (72 tons TNT, or enough energy to light a 100-watt light bulb for up to 95 years). A negative lightning strike typically lasts for only tens of microseconds, but multiple strikes are common. A positive lightning stroke is typically a single event. However, the larger peak current may flow for hundreds of milliseconds, making it considerably hotter and more dangerous than negative lightning. ^ One such jurisdiction is Manitoba, where the Electrician's Licence Act, CCSM E50 establishes classes of electrician's licences by voltage. ^ Gönen, T. (2014). Electrical Power Transmission System Engineering: Analysis and Design (3 ed.). CRC Press. p. 3,36. ISBN 9781482232233. ^ National Institute for Occupational Safety and Health - Fatality Assessment and Control Evaluation: Cases of high-voltage related casualties. Retrieved on November 24, 2008. Electric power transmission is the bulk movement of electrical energy from a generating site, such as a power plant, to an electrical substation. The interconnected lines which facilitate this movement are known as a transmission network and this is distinct from the local wiring between high-voltage substations and customers, which is typically referred to as electric power distribution. The combined transmission and distribution network is known as the grid in North America. In the United Kingdom, the network is known as the National Grid, for example, there are four major interconnections in North America, and one large grid for most of continental Europe. Most transmission lines are high-voltage three-phase alternating current, although single phase AC is sometimes used in railway electrification systems, high-voltage direct-current technology is used for greater efficiency over very long distances. HVDC technology is used in submarine power cables, and in the interchange of power between grids that are not mutually synchronized. HVDC links are used to large power distribution networks where sudden new loads, or blackouts, in one part of a network can result in synchronization problems. Electricity is transmitted at high voltages to reduce the loss which occurs in long-distance transmission. Power is usually transmitted through overhead power lines, underground power transmission has a significantly higher installation cost and greater operational limitations, but reduced maintenance costs. Underground transmission is used in urban areas or environmentally sensitive locations. A lack of energy storage facilities in transmission systems leads to a key limitation. Electrical energy must be generated at the rate at which it is consumed. A sophisticated control system is required to ensure that the power generation very closely matches the demand, if the demand for power exceeds supply, the imbalance can cause generation plant and transmission equipment to automatically disconnect and/or shut down to prevent damage. In the worst case, this may lead to a series of shut downs. Examples include the US Northeast blackouts of 1965,1977,2003, Transmission companies determine the maximum reliable capacity of each line to ensure that spare capacity is available in the event of a failure in another part of the network. Electrical circuits may be connected to ground for several reasons. In mains powered equipment, exposed parts are connected to ground to prevent user contact with dangerous voltage when electrical insulation fails. In electrical power systems, a protective ground conductor is an essential part of the safety Earthing system. Connection to ground limits the build-up of static electricity when handling flammable products or electrostatic-sensitive devices, in some telegraph and power transmission circuits, the earth itself can be used as one conductor of the circuit, saving the cost of installing a separate return conductor. For measurement purposes, the Earth serves as a constant potential reference against which other potentials can be measured, an electrical ground system should have an appropriate current-carrying capability to serve as an adequate zero-voltage reference level. In electronic circuit theory, a ground is usually idealized as a source or sink for charge. Where a real ground connection has a significant resistance, the approximation of zero potential is no longer valid, stray voltages or earth potential rise effects will occur, which may create noise in signals or if large enough will produce an electric shock hazard. This is usually a large conductor attached to one side of the power supply which serves as the return path for current from many different components in the circuit. Long-distance electromagnetic telegraph systems from 1820 onwards used two or more wires to carry the signal and return currents. During dry weather, the ground connection often developed a high resistance, an electrical connection to earth can be used as a reference potential for radio frequency signals for certain kinds of antennas. The part directly in contact with the earth - the earth electrode - can be as simple as a rod or stake driven into the earth. Because high frequency signals can flow to earth due to capacitative effects, because of this, a complex system of buried rods and wires can be effective. 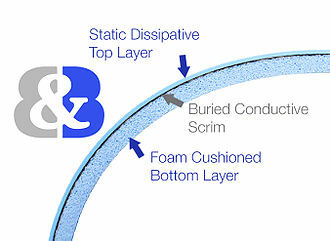 An ideal signal ground maintains a fixed potential regardless of how much current flows into ground or out of ground. Some types of transmitting antenna systems in the VLF, LF, MF, sometimes a counterpoise is used as a ground plane, supported above the ground. The Tesla coil is an electrical resonant transformer circuit designed by inventor Nikola Tesla in 1891. It is used to produce high-voltage, low-current, high frequency alternating-current electricity, Tesla experimented with a number of different configurations consisting of two, or sometimes three, coupled resonant electric circuits. Tesla coil circuits were used commercially in sparkgap radio transmitters for wireless telegraphy until the 1920s, today their main use is for entertainment and educational displays, although small coils are still used today as leak detectors for high vacuum systems. A Tesla coil is a radio frequency oscillator that drives an air-core double-tuned resonant transformer to produce high voltages at low currents, Teslas original circuits as well as most modern coils use a simple spark gap to excite oscillations in the tuned transformer. 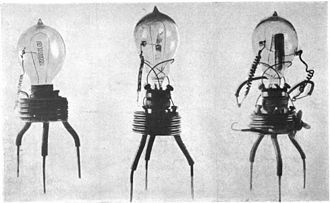 More sophisticated designs use transistor or thyristor switches or vacuum tube electronic oscillators to drive the resonant transformer, Tesla coils can produce output voltages from 50 kilovolts to several million volts for large coils. The alternating current output is in the low frequency range. Typical voltages are between 5 and 30 kilovolts, optionally, a capacitive electrode in the form of a smooth metal sphere or torus attached to the secondary terminal of the coil. Its large surface area suppresses premature corona discharge and streamer arcs, increasing the Q factor, Tesla coil is called resonant transformer, oscillation transformer or radio-frequency transformer. The transformer of Tesla coil has lower coupling coefficient between coils than an ordinary transformer used in AC power circuits, because the coupling coefficient is low, the resonant transformer seems to have low energy transfer efficiency, but the actual energy transfer efficiency is surprisingly good. This is because it is designed to store electrical energy in the tank circuit on the secondary coil. The tank circuit functions as an LC circuit that stores electric energy by the inductance of the secondary coil. The primary coil consisting of a few turns of heavy copper wire or tubing, is connected to a capacitor through the spark gap. Digital electronics or digital circuits are electronics that handle digital signals rather than by continuous ranges as used in analog electronics. All levels within a band of values represent the information state. In most cases, the number of states is two, and they are represented by two voltage bands, one near a reference value, and the other a value near the supply voltage. These correspond to the false and true values of the Boolean domain respectively, Digital techniques are useful because it is easier to get an electronic device to switch into one of a number of known states than to accurately reproduce a continuous range of values. Digital electronic circuits are made from large assemblies of logic gates. The binary number system was refined by Gottfried Wilhelm Leibniz and he established that by using the binary system. Digital logic as we know it was the brain-child of George Boole, Boole died young, but his ideas lived on. In an 1886 letter, Charles Sanders Peirce described how logical operations could be carried out by electrical switching circuits, vacuum tubes replaced relays for logic operations. 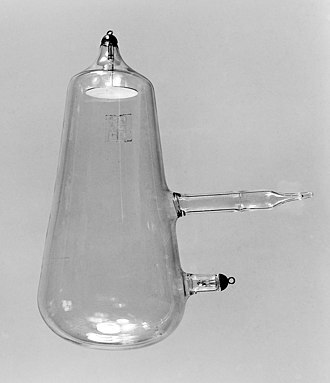 Lee De Forests modification, in 1907, of the Fleming valve can be used as an AND logic gate, ludwig Wittgenstein introduced a version of the 16-row truth table as proposition 5.101 of Tractatus Logico-Philosophicus. Walther Bothe, inventor of the circuit, got part of the 1954 Nobel Prize in physics. Mechanical analog computers started appearing in the first century and were used in the medieval era for astronomical calculations. In World War II, mechanical computers were used for specialized military applications such as calculating torpedo aiming. 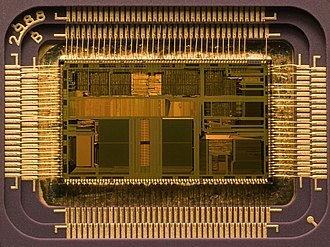 During this time the first electronic computers were developed. Originally they were the size of a room, consuming as much power as several hundred modern personal computers. The Z3 was a computer designed by Konrad Zuse, finished in 1941. It was the worlds first working programmable, fully automatic digital computer and its operation was facilitated by the invention of the vacuum tube in 1904 by John Ambrose Fleming. Purely electronic circuit elements soon replaced their mechanical and electromechanical equivalents, the bipolar junction transistor was invented in 1947. The National Electrical Code, or NFPA70, is a regionally adoptable standard for the safe installation of electrical wiring and equipment in the United States. It is part of the National Fire Codes series published by the National Fire Protection Association, despite the use of the term national, it is not a federal law. 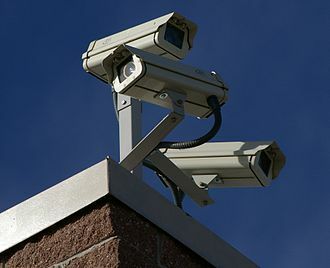 It is typically adopted by states and municipalities in an effort to standardize their enforcement of safe electrical practices, in some cases, the NEC is amended and may even be rejected in lieu of regional regulations as voted on by local governing bodies. The authority having jurisdiction inspects for compliance with minimum standards. The NEC is developed by NFPAs Committee on the National Electrical Code, which consists of 19 code-making panels, work on the NEC is sponsored by the National Fire Protection Association. The NEC is approved as an American national standard by the American National Standards Institute and it is formally identified as ANSI/NFPA70. First published in 1897, the NEC is updated and published three years with the 2017 edition being the most current. Most states adopt the most recent edition within a couple of years of its publication, as with any uniform code, a few jurisdictions regularly omit or modify some sections, or add their own requirements. However, the NEC is the least amended model code, even with it setting minimum standards, no court has faulted anyone for using the latest version of the NEC, even when the local code was not updated. In the U. S. anyone, including the city issuing building permits and those who fail to adhere to well known best practices for safety have been held negligent. This liability and the desire to protect residents has motivated cities to adopt and enforce building codes that specify standards and this creates a system whereby a city can best avoid lawsuits by adopting a single, standard set of building code laws. 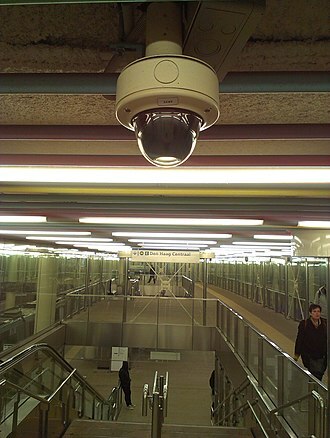 This has led to the NEC becoming the de facto set of electrical requirements. A licensed electrician will have spent years of studying and practicing the NEC requirements prior to obtaining his or her license. S.
An electrode is an electrical conductor used to make contact with a nonmetallic part of a circuit. 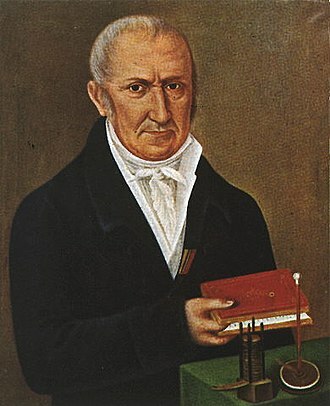 The word was coined by William Whewell at the request of the scientist Michael Faraday from the Greek words elektron, meaning amber, and hodos, an electrode in an electrochemical cell is referred to as either an anode or a cathode. The anode is now defined as the electrode at which electrons leave the cell and oxidation occurs, each electrode may become either the anode or the cathode depending on the direction of current through the cell. A bipolar electrode is an electrode that functions as the anode of one cell, a primary cell is a special type of electrochemical cell in which the reaction cannot be reversed, and the identities of the anode and cathode are therefore fixed. The anode is always the negative electrode, the cell can be discharged but not recharged. A secondary cell, for example a rechargeable battery, is a cell in which the reactions are reversible. When the cell is being charged, the anode becomes the positive and this is the case in an electrolytic cell. 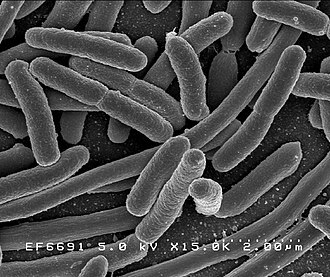 When the cell is being discharged, it behaves like a cell, with the anode as the negative. In a vacuum tube or a semiconductor having polarity the anode is the positive electrode, the electrons enter the device through the cathode and exit the device through the anode. Many devices have other electrodes to control operation, e. g. base, control grid. In a three-electrode cell, an electrode, called an auxiliary electrode, is used only to make a connection to the electrolyte so that a current can be applied to the working electrode. The counter electrode is made of an inert material, such as a noble metal or graphite. 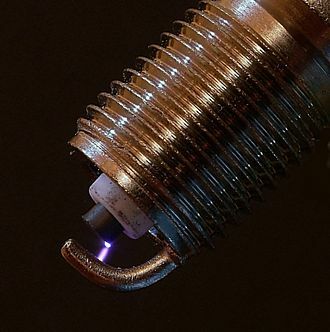 In arc welding an electrode is used to conduct current through a workpiece to fuse two pieces together. Depending upon the process, the electrode is either consumable, in the case of gas metal arc welding or shielded metal arc welding, or non-consumable, such as in gas tungsten arc welding. For a direct current system the weld rod or stick may be a cathode for a filling type weld or an anode for other welding processes, for an alternating current arc welder the welding electrode would not be considered an anode or cathode. A corona discharge is an electrical discharge brought on by the ionization of a fluid such as air surrounding a conductor that is electrically charged. 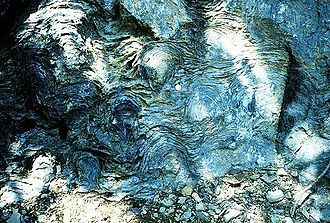 Spontaneous corona discharges occur naturally in high-voltage systems unless care is taken to limit the field strength. It is often seen as a glow in the air adjacent to pointed metal conductors carrying high voltages. In many high voltage applications corona is a side effect. Corona discharge from high voltage power transmission lines constitutes an economically significant waste of power for utilities. In high voltage equipment like televisions, radio transmitters, X-ray machines, in air, coronas generate gases such as ozone and nitric oxide, and in turn nitrogen dioxide, and thus nitric acid if water vapor is present. These gases are corrosive and can degrade and embrittle nearby materials, corona discharges can often be suppressed by improved insulation, corona rings, and making high voltage electrodes in smooth rounded shapes. However, controlled corona discharges are used in a variety of such as air filtration, photocopiers. The ions generated eventually pass charge to nearby areas of lower potential, when the potential gradient is large enough at a point in the fluid, the fluid at that point ionizes and it becomes conductive. If a charged object has a point, the electric field strength around that point will be much higher than elsewhere. Air near the electrode can become ionized, while more distant do not. When the air near the point becomes conductive, it has the effect of increasing the apparent size of the conductor, since the new conductive region is less sharp, the ionization may not extend past this local region. Outside this region of ionization and conductivity, the particles slowly find their way to an oppositely charged object and are neutralized. Corona discharge usually forms at highly curved regions on electrodes, such as corners, projecting points, edges of metal surfaces. 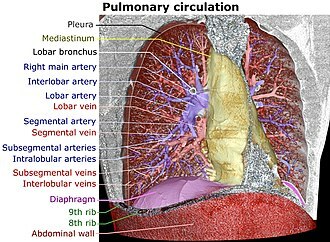 The high curvature causes a high potential gradient at these locations, so that the air breaks down, Coronas may be positive or negative. The Institution of Engineering and Technology is the largest multidisciplinary professional engineering institution in the world. The IET was formed in 2006 from two institutions, the Institution of Electrical Engineers, dating back to 1871, and the Institution of Incorporated Engineers dating back to 1884. Its worldwide membership is currently in excess of 167,000, the IETs main offices are in Savoy Place in London, England and at Michael Faraday House in Stevenage, England. The IET is registered as a charity in England and Wales, discussions started in 2004 between the IEE and the IIE about merging to form a new institution. In September 2005, both institutions held votes of the merger and the members voted in favour. This merger needed government approval, so a petition was made to the Privy Council of the United Kingdom for a Supplemental Charter. This was approved by the Privy Council on December 14,2005, the Society of Telegraph Engineers was formed on May 17,1871, and it published the Journal of the Society of Telegraph Engineers from 1872 through 1880. Carl Wilhelm Siemens was first President of IEE in 1872, following a meeting of its Council on 10 November 1887, it was decided to adopt the name of the Institution of Electrical Engineers. The name of the Institution of Electrical Engineers remains engraved in the marble façade of its headquarters at Savoy Place, as part of this change, its Journal was renamed Journal of the Institution of Electrical Engineers in 1889, and it kept this title through 1963. It was well known for publication of the IEE Wiring Regulations which now continue to be written by the IET, the IET hosts the archive for the Womens Engineering Society and it has provided office space for WES since 2005. It changed its name in 1976 to the Institution of Mechanical and General Technician Engineers, at this point it merged with the Institution of Technician Engineers in Mechanical Engineering and formed the Institution of Mechanical Incorporated Engineers in 1988. The Institution of Engineers in Charge, which was founded in 1895, was merged into the Institution of Mechanical Incorporated Engineers in 1990, in 1999 there was a further merger with The Institution of Incorporated Executive Engineers. An electric field is a vector field that associates to each point in space the Coulomb force that would be experienced per unit of electric charge, by an infinitesimal test charge at that point. Electric fields are created by electric charges and can be induced by time-varying magnetic fields, the electric field combines with the magnetic field to form the electromagnetic field. The electric field, E, at a point is defined as the force, F. A particle of charge q would be subject to a force F = q E and its SI units are newtons per coulomb or, volts per metre, which in terms of SI base units are kg⋅m⋅s−3⋅A−1. Electric fields are caused by electric charges or varying magnetic fields, in the special case of a steady state, the Maxwell-Faraday inductive effect disappears. The resulting two equations, taken together, are equivalent to Coulombs law, written as E =14 π ε0 ∫ d r ′ ρ r − r ′ | r − r ′ |3 for a charge density ρ. Notice that ε0, the permittivity of vacuum, must be substituted if charges are considered in non-empty media, the equations of electromagnetism are best described in a continuous description. A charge q located at r 0 can be described mathematically as a charge density ρ = q δ, conversely, a charge distribution can be approximated by many small point charges. Electric fields satisfy the principle, because Maxwells equations are linear. This principle is useful to calculate the field created by point charges. Q n are stationary in space at r 1, r 2, in that case, Coulombs law fully describes the field. If a system is static, such that magnetic fields are not time-varying, by Faradays law, in this case, one can define an electric potential, that is, a function Φ such that E = − ∇ Φ. This is analogous to the gravitational potential, Coulombs law, which describes the interaction of electric charges, F = q = q E is similar to Newtons law of universal gravitation, F = m = m g. This suggests similarities between the electric field E and the gravitational field g, or their associated potentials, mass is sometimes called gravitational charge because of that similarity. Electrostatic and gravitational forces both are central and obey an inverse-square law, a uniform field is one in which the electric field is constant at every point. It can be approximated by placing two conducting plates parallel to other and maintaining a voltage between them, it is only an approximation because of boundary effects. Unipolar coil design widely used in modern coils. The primary is the flat red spiral winding at bottom, the secondary is the vertical cylindrical coil wound with fine red wire. The high voltage terminal is the aluminum torus at the top of the secondary coil. Bipolar coil, used in the early 20th century. There are two high voltage output terminals, each connected to one end of the secondary, with a spark gap between them. The primary is 12 turns of heavy wire, which is located at the midpoint of the secondary to discourage arcs between the coils. Henry Rowland's 1889 spark-excited resonant transformer, a predecessor to the Tesla coil. 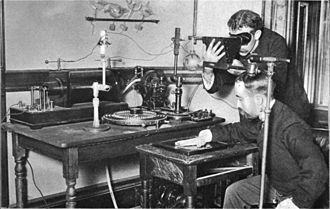 De Forest's prototype audio amplifier of 1914. 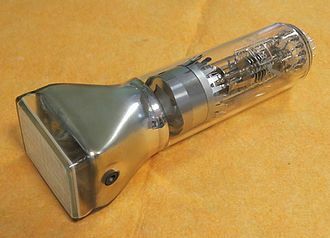 The Audion (triode) vacuum tube had a voltage gain of about 5, providing a total gain of approximately 125 for this three-stage amplifier. Power amplifier by Skyworks Solutions in a Smartphone. Replacing an advertising poster in London using an aerial work platform. "Spider" set up outside a building. 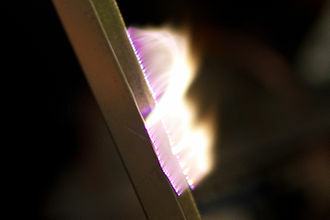 Electrical breakdown in an electric discharge showing the ribbon-like plasma filaments from a Tesla coil. A Motorola 68000-based computer with various TTL chips mounted on breadboards. A real-time clock built of TTL chips around 1979. 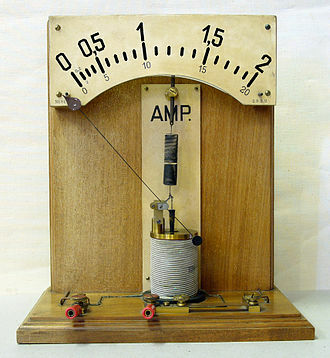 Demonstration model of a moving iron ammeter. As the current through the coil increases, the plunger is drawn further into the coil and the pointer deflects to the right.